Dog printables for kids - including a cute dog mask to print, writing printables for the classroom and home, jigsaw, poster and more! Here's a quick little Christmas jigsaw that the kids will love to puzzle over! Just print onto card then, using our jigsaw instructions and cutting guides, choose the most appropriate level for your child. Easy to store and lots of fun! Here's an adorable Christmas puppy lacing card for your kids to enjoy. Just print, cut out and punch holes evenly around the outer edges. Of course, you can laminate so that you can use repeatedly if you wish. 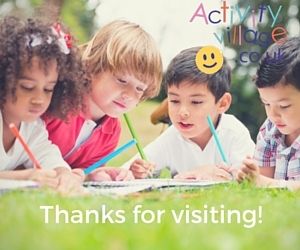 Print out this simple worksheet which encourages children to observe what's missing and add in the details themselves - a fun copying and colouring exercise! Queen Elizabeth II is a huge fan of corgis, so she'd probably love these cute corgi bookmarks as much as we do! Print onto some card and cut out carefully. You can laminate them too for extra durability. Here's a fun printable lacing card featuring a lovely corgi which your children will love to lace or sew! Punch holes around the edges and either sew or lace with a shoelace or wool. Laminate for extra strength and if you wish to reuse. Just a fun poster of a corgi - perfect for a royal theme, or for kids who like corgis! What an adorable corgi! Print using the borderless settings on your printer for the best results, then use for displays and topic work. Our corgi printable jigsaw is a great way to entertain young children. Simply print on to some card and cut out following our jigsaw instructions and cutting guides. The Corgi is a very cute breed of dog originating from Wales. We've got three versions of this adorable corgi writing paper to choose from below, perfect for all your writing projects! Do you love dogs? This D is for Dog poster features a very cute example. Why not print out the whole set of alphabet posters and make a great display? Our dog and kennel poster is perect to help children who are learning the vocabulary of animal homes. The fluffy puppy on our dog and puppy poster looks so very cuddly. This lovely poster is sure to be a favourite of any dog lovers. Print and fold this little dog booklet. It's useful for stories, writing practice, pictures, notes and all sorts! You will need our origami booklet instructions to fold this booklet. Write down some of your dog's favourite things in this fun foldable booklet, or use it to store facts and information about dogs. Four cute dog bookmarks printables for kids. Just print, cut out, add a message, and laminate if you like. Colour in this jigsaw and then cut into strips. Children need to be able to put the strips 1 - 10 in the correct order to complete our dog counting jigsaw. When they have mastered their numbers you can cut them off the bottom and still enjoy the jigsaw without them. Make your own simple dog-themed door hanger with this printable. Print, cut out and fold in half and stick together, then cut out the circle - your doggy door hanger is ready to hang on your door handle! Who could resist this funny dog jigsaw? Just print, cut out using our printable guides, and the kids will have fun putting it back together again. Instructions and cutting guides for this jigsaw are here. We just love this little dog - he seems like the perfect companion for a child! Here he is in jigsaw format. It makes a quick activity and it's simple to do (using our Jigsaw Cutting Guides). Tailor the jigsaw for the age of your children. Here's a simple poster of a dog kennel - perfect for a pet animal theme. Attention dog lovers! This lacing card is for you! Easy to make, this is a great card for older children to try as its more complicated outline provides a bit of a challenge. 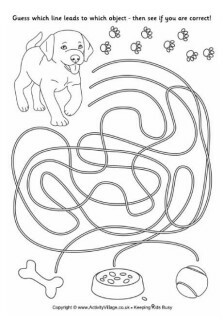 This dog lacing card is perfect for younger children, with its nice easy outline! Just print onto card and punch holes evenly around the edges for lacing. Laminate if you like. Here is the first of 3 colourful dog lacing cards designed especially for younger children. This blue puppy is quick and easy to cut out and prepare, and fun to lace too - and he has a very cute face which is sure to appeal. This dog lacing card has very simple outlines - making it a fun, quick project to print, cut out (and laminate if you wish) for the kids to lace. Dogs aren't normally green - but I think that's what makes this lacing card even more fun for younger kids! The edges are quick and simple to cut out, punch and lace. Print out this cute dog mask for the kids to cut out and wear - perfect for dressing up, parades and fun! Can the kids use their playdough to make a dog to live in the kennel on the playdough mat? Great for a pet animal theme. Dogs love a big juicy bone! Can the kids use their playdough to make one for this pooch? Who could resist this cute little puppy dog? The poster is free to print and ready to display in your classroom or home. Here's a photographic poster of an adorable pup to print and put on display. Borderless settings give the best result. If your child loves dogs they're bound to love this fun room sign. To make, simply print onto strong white paper or card, write their name (or ask an older sibling to write it for them) then laminate to make the sign stronger. Do you have a dog lover? If so they are sure to love our delightful printable dog scene poster. This dog spelling jigsaw is perfect for early learners! 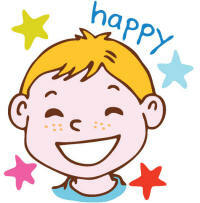 It comes in black and white for the kids to colour first, or in colour, with three simple pieces to put back together. Here is a simple dog template to print. Use the outline for kids crafts, the classroom or for scrapbook or notebook projects.. There are multiple sizes in the pdf file below. This floppy dog makes a fun illustration for our writing paper - a pefect page for a thank you letter to a friend who loves dogs, perhaps? Learn ordinal numbers with the help of this lovely jigsaw. Choose from colour or black and white. If choosing the black and white version, ask the kids to colour it in first. Now slice up the jigsaw, including the numbers. Can the kids put it back together again in the right order? We've got the perfect greetings card for dog-lovers! It's easy to print (and looks best if you use borderless print settings), simply fold and write your message inside! This dog looks lovely with a pretty flower on her ear, and her pup is very cute too. Print and put on the wall in any dog-lovers bedroom! Here's a fun printable activity for a royal theme - or for children who love dogs! Learn to draw a corgi by following the steps in this tutorial, then colour it in using our guidelines. This origami dog printable is folded in the same way as our origami dog, but with folding lines to make it even simpler for little children. Write a list of tricks to teach the dog - and then you can tick them off when you have done it! Start with "sit" and "stay", perhaps? 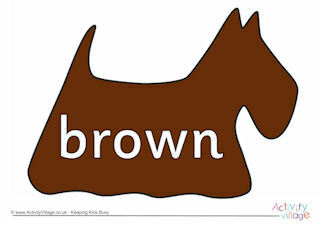 We have even more dog printables as part of our Scottie dog theme. You'll find collection of templates, posters and other fun printables based on the iconic Scottie dog!